Probably the question I get asked most frequently about the Idaho Falls Zoo is “What do you do with all those animals in the winter?” Believe it or not, they ALL stay right here at the zoo, from the tiniest little birds, to the alligator, to the penguins. About half of them, mostly birds and reptiles, have to be moved into indoor holding areas located inside some of the zoo buildings for their health and overall well-being during colder weather. The other half stay right in their exhibits where you see them when you come to the zoo, including all the cats. Idaho Falls Zoo has a pair of African lions, a male (named Dahoma) and a female (named Kimani). Lions live in the savannas, or grasslands of Africa. Both lions were born in other zoos in North America and have beautiful thick fur coats, but that doesn’t mean they like the cold. Because the cats we have were not born in Africa, they might be a bit more tolerant to the cold than lions that were born and live in a warmer climate. During the winter days, they have access to both their outside exhibit and a large, cozy, heated den area. At night, they come in to the indoor den area because they know their dinner (meat and sometimes bones) is waiting for them, and we lock the den up to keep them inside, warm and safe. The leopards you see at Idaho Falls Zoo are snow leopards native to the Asian highlands. Currently we have a male (named Ketu), a female (named Sudarii) and their female cub. The cub is scheduled to move to Jungle Cate Wildlife Park in Canada in the spring. Just like our lions, they were all born in North American zoos. However, regardless of where they are born, just as their name suggests, snow leopards LOVE the snow, and their bodies are perfectly adapted for cold weather. They have amazingly thick fur, short ears, and even have fur growing between the pads of their feet. Their tail acts as a natural scarf, and they wrap it around their faces to stay warm and protect their nose and eyes from freezing temperatures. 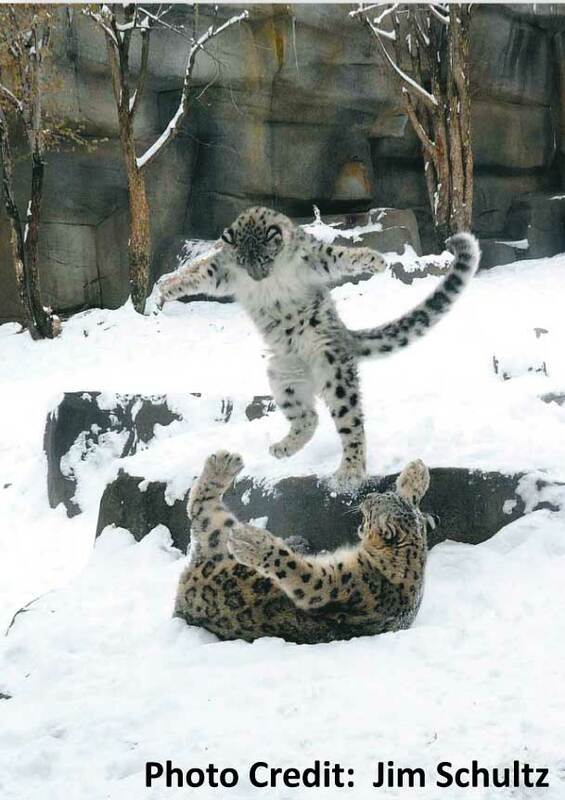 They absolutely love it when it snows and will spend hours playing in their exhibit following a fresh snowfall. They also have daily access to a warm indoor den area, and while they don’t need to come inside at night to stay warm like lions, we still bring them in to feed them dinner and to ensure their safety. How do tigers and servals spend winter next week. Heat flows from hotter to colder things. To stay warm, humans and animals use insulation, which blocks heat escape routes from the body. When the weather turns colder in the wintertime, you put on an extra layer (or two!) of clothes before you go outside to keep warm. The extra clothing acts as an insulating layer around you, resisting the flow of heat to the cooler outside air. How do fur coats keep animals warm when it’s cold outside? Trapped air in fur blocks the flow of body heat into the cold. Place 12-15 cotton balls in one bag and zip in shut. Place several ice cubes in the second bag. Add 1/2 cup water. Zip the bag shut. Put the cotton ball bag on the palm of one hand, then place the ice bag on top. Does your hand feel cold? Remove the bags and put the empty bag on your palm. Put the ice bag on top of it. Does your hand feel cold? How are the cotton balls like fur? ← Why are gamma rays more harmful than radio waves?